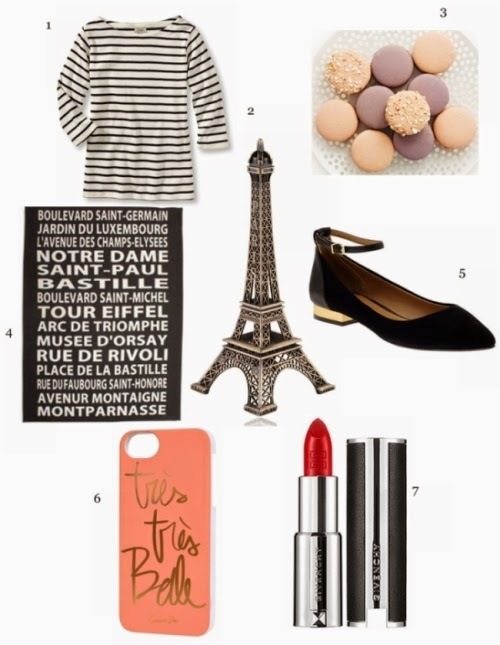 In honor of Bastille Day today, here are a few French-inspired bits and pieces. The quintessential French girl shirt. A mini Eiffel Tower that offers a daily dose of Paris from a desk or kitchen counter. Lovely French macarons--always a good idea. A kitchen towel that could possibly double as wall art. Sweet flats reminiscent of something Catherine Deneuve would have worn in The Umbrellas of Cherbourg. A cute phone case by the ever stylish Garance Doré. The ultimate French-chic lip color.